Hi friends! This is Yat Kuan from Universiti Sains Malaysia (USM). Wherever you are right now, I believe that you guys are doing fine. Here, I would like to briefly share about what I have learned from this summer school programme and also field research conducted in Georgetown, Penang. Honestly, my knowledge on history is finite because I am originally not from historical background. Initially, I felt anxiety because I have not much knowledge on history. However, throughout a series of lectures class, I feel relax because the classes were very fascinated and all of the lecturers were willing to share their knowledge and even experiences. During the first week of the programme, some classes are scheduled for us to get better understanding on what is about "past" and how is the "past" shape the memory and identity of the people in the society. Lecturers such as Prof. Vincent Houben, Prof. Bambang Purwanto, Dr. Soon, Dr. Margana, Dr. Lye, Dr. Mahani, Aleah, Li Feng and Brooke shared their knowledge and experiences in history and even field research as well. They are expert enough to give fascinating classes on historical knowledge and share their fieldwork research. Besides, some case studies were presented well by the lecturers in order to provide abundant of information on history, namely Germany and Quebec, Banyuwangi, Netherlands, Philippines, Georgetown and so on and so forth. Apart from the sharing session of case studies, some conceptual knowledge, includes history, collective memory, historiography, identity, embodiment and qualitative research methods also have been shared and discussed during the classes. By this means, I have gained a lot of historical knowledge which may be included in my future research. During the second week of the programme, we conducted a field research in a place that is well-known of its heritage sites in Georgetown, Penang. I have been grouped with a German friend, Sandra and an Indonesian friend, Riris to conduct a research on Teochew Puppet and Opera House. Teochew Puppet and Opera House is a Teochew-based museum located in 122, Armenian Street, Georgetown. It operated since last year by Ling Goh, the director of the museum and aims to bring back the traditional Teochew culture to the public. 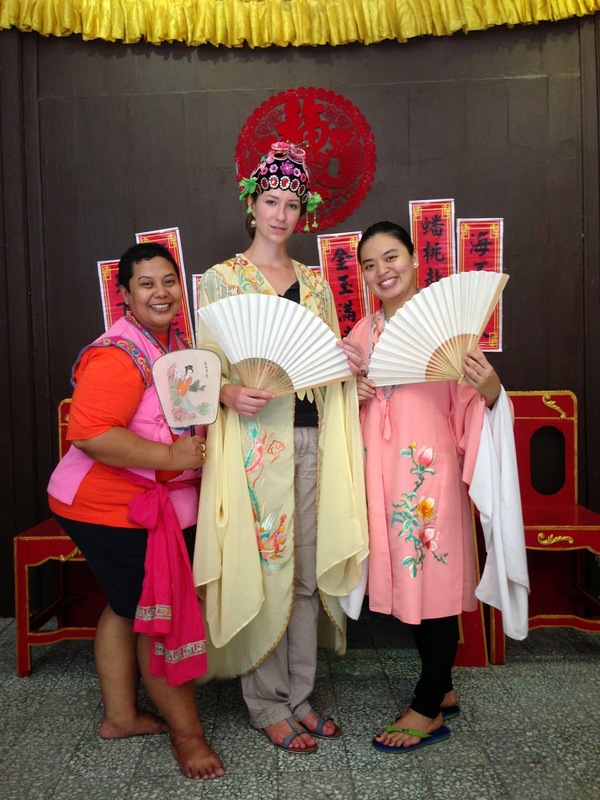 During the field research, we were lucky to have a chance to visit to the museum and study the Teochew culture in-depth. With that, we learned about how it constructs the memory and identity of public. Initially, our group had made a call to Ling Goh and asked her permission to do an interview with us. But unfortunately, due to her full scheduled throughout the year, we are not able to interview her. Luckily, our group managed to contact her assistant, Mr. Chew, who works in the museum and have abundant of knowledge about the Teochew culture and museum itself. He was passionate in explaining the embedded messages in Teochew culture which include how it he local memory, collective memory and even cultural identity of public, especially for the Teochew's group. According to Mr. Chew, the museum is functioning as a platform that provides a better understanding on Teochew culture, especially the puppet shows and live performances. Puppet shows is the representative of Teochew culture and it often plays by Ling Goh herself and also puppeteers from her Teochew Opera Troupe. Normally, the small puppet shows and live performances are performed in the museum and open to public. However, the opera troupe will be invited to perform in various places, such as local temples and those in Thailand and Cambodia during the major festivals or celebrations. Other than that, the Teochew Puppet and Opera House is also available in Facebook. Public can add them (潮艺馆Teochew Puppet & Opera) and drop their comments in the page. Public can even get the updated information from the page regarding the time schedule of the opera show. In the museum, there are many Teochew displays, includes puppets, headgears, weapons, cosmetics, music instruments, scripts and costumes set are distributed around the museum. When I first step into the museum, I was not only a researcher, but also a visitor. I went around the museum and tried to understand Teochew culture by asking help from Mr. Chew for more explanation. He is an enthusiastic guide who had shared a lot of information and knowledge about Teochew culture to my group mates and I. 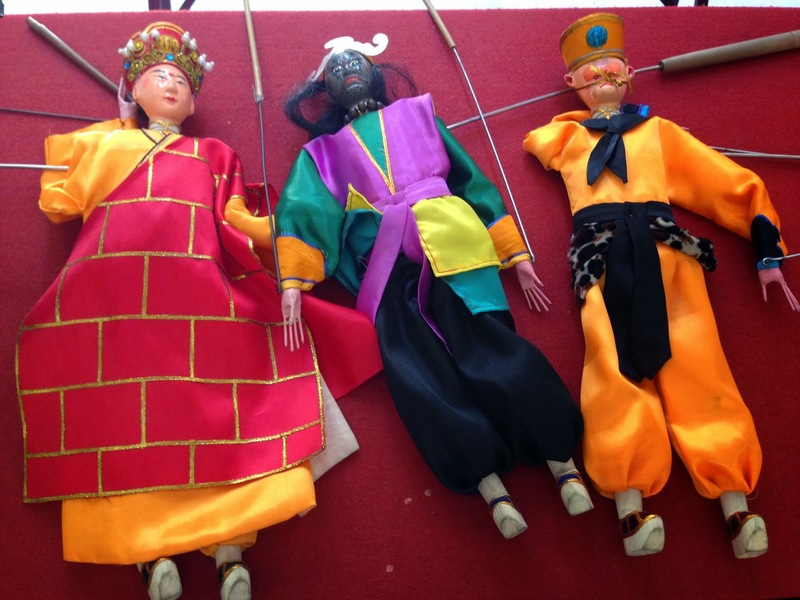 Besides, he shared his working experience and the origin and structure of Teochew puppet shows. 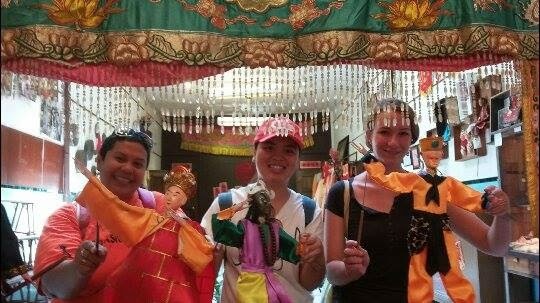 Apart from the sharing session from Mr. Chew, Riris, Sandra and I have an extraordinary experience to play the puppet and wear the traditional costumes, which are worn by the opera performers for their live performance. Generally, the costumes are matched with headgears, weapons and sometimes with some accessories. Every characters have their own set of costumes which represent different roles in the opera shows. I enjoyed these two weeks of the summer school programme and it has benefited me on the knowledge about the "past". Meanwhile, I have an opportunity to get interactions with all the lecturers and friends from Germany, Indonesia, Vietnam and even Malaysia. Once again, thanks for their sharing and discussion throughout the programme. I wish all of you the best in the future. It has been my pleasure to have you guys in these two weeks summer school programme. Take Good Care and do Keep in Touch! Last but not least, I would like to express my appreciation especially to Dr. Soon and Dr. Lye for giving me an opportunity to take part in this interesting programme.